Music therapy is today’s topic with John Carpente, PhD, who is an Expert DIR Training Leader, an Associate Professor of Music Therapy at Molloy College, founder and executive director of the Rebecca Center for Music Therapy, and founding clinical director of the Center for Autism and Child Development at Molloy College. He is the owner of Developmental Music Health Services, LLC and founding music therapist and creator of the DIR/Floortime-based music therapy program at the Rebecca School in New York City where he participated in weekly supervision and case conferences with Dr. Stanley Greenspan. He says that many people at first don’t really get the nuances of what’s going on musically and that it’s a clinical way of thinking and working. He immediately read Engaging Autism, which had just been released. He realized that he did everything that was being described in the book. It naturally resonated with him but he hadn’t understood why it works until he learned more about the DIR Model. He says that Floortime is how we live our lives. A lot of people view ‘fun’ as not therapeutic. 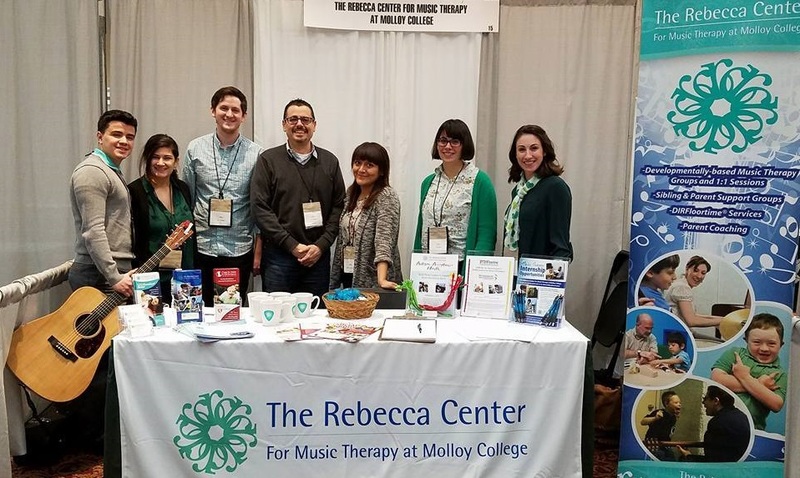 He treasures his experience at the Rebecca School and he was able to figure out how his role as a music therapist fit in with the Developmental, Individual differences, Relationship-based (DIR) Model. He struggled at first with the “I”, or Individual differences part of the model because some of the children had auditory processing challenges. So his first step was figuring out how to take into account each child’s sensory profile. When he holds a session, there are a variety of instruments including percussive instruments, a piano, a guitar, etc. He will improvise music based on how the child walks in the room, picking up on the tempo in the way he walks, or picking up on the affect the child brings, or making music to the stimming behaviour the child is doing. Some children may not understand a drum for what it is, but approach it with curiosity and might just randomly bang on it. He’s not going to say “that’s not how you play it“. Rather, he’s going to follow his lead and try to make music that will accompany it and enhance it and bring it to some compositional form. He also sees how children may not realize that instruments can communicate with each other. Dr. Carpente says that the techniques used in his music therapy sessions are really the same as outside music therapy. He uses mirroring, for example, such as imitating what the child does on the drum, or he’ll add an element such as making something melodic on the piano while the child perseverates on the beating of a drum. He wants the child to let him in his world. People ask him, “Well how do they learn if you just follow their lead?” He says this concept is misunderstood. He follows the child lead’s until he gets shared attention and he sees there’s some co-regulation going on. Now he might change the tempo and now it becomes therapist lead, and he sees what the child will do with it next. Will the child go faster, go slower, or withdraw from the interaction because he doesn’t know what to do? For children with sensory challenges, he can slow down or he can switch from piano to voice if the piano is too loud. He describes how a child he worked with physically stopped him from playing every instrument as he switched, so eventually he started whistling and running around the room. Then he’d stop and the student would chase him and smile. He can get a really good interaction going with many circles of communication even when it doesn’t look like conventional music. He will try to determine if this is just producing cause-and-effect relationships where he’s just an object of sound, or if they can have an aesthetic relational experience that’s loaded with affect. He can create a musical form and leave spaces and get the child’s attention. He can play in between the child’s beats and bring his voice in and some kids will sing back the melodic rhythm. When he started with DIR, he wasn’t thinking developmentally. Many things get in the kids’ way of engaging in music–especially their individual differences. Dr. Carpente provides his music therapy in the context of interaction. You have to meet the child where (s)he is developmentally. With one child, he used a rocking game chair to get vestibular input to the child and he played the guitar to the beat of the rocking. He then stopped when the child stopped so the child sees the impact he has. The child had a hard time communicating so would hit to communicate. John put his hand out and as they hit together and John sang notes as they were slapping hands, bringing melody, purpose, and organization to it. Dr. Carpente can even bring the symbolic into the therapy with some kids. He’s brought puppetry into music making, using the puppets as props to make the music, for example, or a child might play air guitar. Playing music in their own ways with the intent to connect with someone else is John’s goal. Making music with someone is an abstract experience. The way that the child plays music is a manifestation of where they are developmentally and it’s our job to figure that out, all within the context of this relational experience. When children are dysregulated, Dr. Carpente uses co-regulation in the context of music where he might provide deep pressure while he’s singing to the beat of the pressure he’s providing. He likes to think of co-regulation as way to help the child develop resources to become self-regulated within an interaction as opposed to doing it in an isolated way. We hope this goes across contexts. How can we engage with him when he’s dysregulated? Why do we have to make him happy? We have to get into the child’s emotional state and say through these actions that it’s ok to feel this way, and now how do we get back? We also want to facilitate them learning how to modulate their emotions themselves. Dr. Carpente spent some time discussing how we can confuse being musical to being musically sensitive or aware of musical patterns. When the child will feel the need to fill in a missing beat, for instance, this might just be about noticing a pattern. He also has found that autistic children who have perfect pitch can have poor auditory filtration systems, so they hear everything, and if you break from a particular tone, they don’t like it. Kids might have propensity for certain elements of music. Melody and rhythm are repetitive and predictable so some kids have a sensitivity to that. Some musical savants might be able to play music with great accuracy and when John changes it up they can replicate it exactly as well, but the therapist modelled it for them. The question is if the child can initiate that. They might learn quickly that they can use their great abilities to keep you from them because interacting is such a challenge for them. Many parents will say their child is very musical and will list the musical skills the child has such as knowing all the songs of a certain artist, etc. But if you change a lyric or note, they have trouble with that, similar to scripting versus spontaneous language. John’s goal is to work on that flexibility and interaction, rather than simply engage in the musical patterns the child enjoys repetitively. There’s a difference between teaching musical skill versus providing musical experiences to expand communication and relatedness to be affectively connected. When you notice your child liking drums or singing all of a sudden, of course John says you can foster this. But his concern is more about how can we teach the child to play music, or even with academics, to add, while in the context of Floortime. It’s the social emotional skills that don’t hold enough weight compared with music or academic skills, and these cannot be taught. Everything is done within the relationship and the interest has to come from the child. The Rebecca School reinforced the way Dr. Carpente wanted to work. It helped him figure out his identity as a clinician. Everything they do at the Rebecca Center at Molloy College uses the same concepts. And when he wanted to create a clinical version of what he had at the Rebecca School, the Center for Autism and Child Development was born where they do music therapy and Floortime on its own as well. He says that they work in a developmental way, and do not focus on isolated behaviours. They look at the child as a whole. He also points out that we no longer see any more ABA studies that look at isolated behaviours. We are now seeing blended strategies that combine behavioural and developmental strategies–which is of course odd since they are conceptually incompatible, but nonetheless, the trend is moving towards a developmental approach. Thank you to Dr. John Carpente for taking the time to share his work with us. If you have any comments, questions, or experiences to share, please comment in the section below. Please consider sharing this post on Facebook or Twitter if you found it enlightening and informative about how through musical experiences, you can share joy with your child in a Floortime way.